According to the District of Columbia’s Annual Economic Report for 2016, almost 40 percent of individuals living in both Wards 8 and 7 of Washington, D.C. lived below the poverty level. In a report published more recently in August of 2017 by the District of Columbia’s Department of Employment Services (DOES), the overall unemployment rate for Ward 8 was 14.2 percent. That percentage being 2.9 percent higher than the second lowest rate in the District held by Ward 7. NOVEMBER 20 – In the spirit of Thanksgiving, Enlightened, Inc. helped councilmember, Trayon White, feed 1,500 Ward 8 families at his Annual Turkey Giveaway. As a way to give back to the community that resides in Ward 8, Enlightened traveled to Union Temple Church in Southeast Washington, D.C. on Monday, November 20, 2017. At Union Temple Church, Enlightened joined Ward 8 councilmember, Trayon White, as well as many others to volunteer and participate in the Annual Turkey Giveaway. 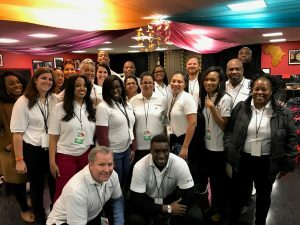 Each year, White’s Turkey Giveaway feeds 1,500 Ward 8 families during the Thanksgiving holiday and Enlightened helped organize and serve the food that was given to each family. Often on Thanksgiving, social media is saturated with the recurrence of three words: Family, Food, and Football. This is because on this day, Americans across the country come together, often with their loved ones whether it be their family or their friends. Additionally, the average family often cooks an abundance of food while watching their favorite football team hopefully come away with a victory. Throughout all of this, they give thanks for the ability to come together and celebrate. But, not everyone’s day is filled with all three “f’s”. Some do not have family or, family that is easy to visit. Some do not have facile access to food and some do not have a television in which they could gather around to view the victory of their football team. So, on this day, Enlightened helped incorporate one of the three “f’s” of the Thanksgiving holiday to the Ward 8 community: Food.